In my last blog post I talked about trying to narrow down a sofa for my client. We finally chose a sofa, went to buy it and womp womp the lead time for the grey velvet couch was two months. My client did not want to wait that long. Thankfully there was another velvet option (texture is key people!) and it was navy blue. My client and I got on the phone and I pointed out that you can treat navy like a neutral. The photo above gives an idea of the style my client wanted- a little bit boho and a little bit mid-century modern. 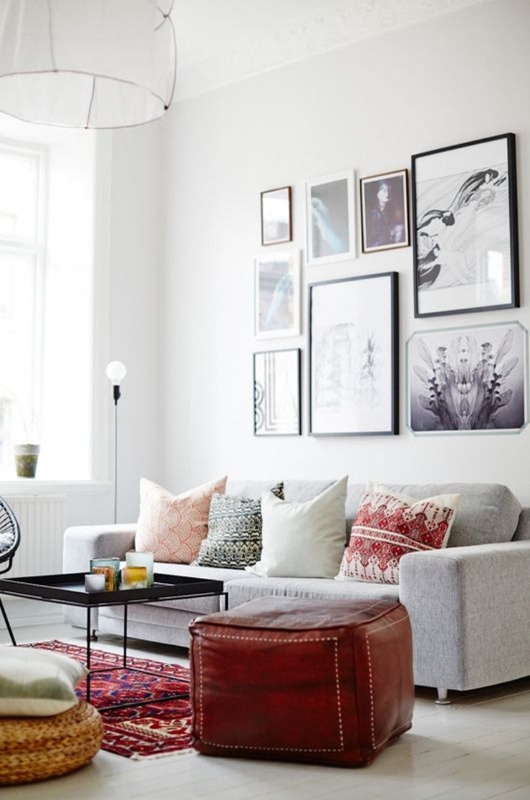 Basically crisp furniture with layers of bohemian art and textiles. A few years back navy hit the fashion runways and it was heralded as the new black. Well, what goes around comes around and fashion trickles into interiors more often than not. I did a quick search of navy sofas in a boho/modern style and pinterest did not disappoint. After looking through these images and chatting on the phone my client agreed to the navy blue sofa. Thankfully when it arrived she liked it even more. If you would like some interior design help please feel free to drop me a line.